Photo above of Wheat Sheaf pre 1890. Above photo from the John Gilham collection, circa 1920. An outlet of Kingsford, which in its time had also obliged George Beer and Rigden. It stood on the corner, part facing Ladywell. It did not often make the headlines but we do know of its presence in 1858 from Melville's Directory of the same year, and also from the passage below, where Thomas East threatened his father, the landlord, in 1864. Further research has now turned up a Coroner's inquest held inside the building in 1846. From the Dover Telegraph and Cinque Ports General Advertiser, Saturday, 18 April, 1846. Price 5d. Charles Hawkins, 35, carrier, charged with stealing, at St. Mary's, Dover, one barrow, the property of James Bray, the contractor of the harbour improvements. The prosecution was conducted by Mr. Addison, and Mr. Horne defended the prisoner. William Firth: I am in the employ of Mr. Bray, and recollect barrows being missed since Michaelmas last: the barrow produced is marked as the one lost was. The barrows were marked “J.B.” three years since. By Mr. Addison: I am the only one that has been employed in making and mending barrows since Michaelmas. The mark on the wheel of the barrow produced is the right mark; another mark is scratched off on the side. James Marsh, Policeman: I got the barrow at Mr. Eastes, of the “Wheat Sheaf,” on the 6th of March. It has been in his possession ever since. William Eastes, landlord of the “Wheat Sheaf”: I bought the barrow off Hawkins for 4s. he brought it to my house himself . I obtained it under the following circumstances: Whilst speaking to a carpenter about making me a barrow, Hawkins, who was present, said he would lend me one. When he brought it in he offered to sell it, saying he did not require it himself. He was gone an hour to fetch it; he lives about a mile from my house. Cross-examined by Mr. Horne: It was in the forenoon; he was bringing some flints for a job I was doing. I cannot say whether he brought it from his house or from a stable. I have known him four years, but know nothing prejudicial to his character. John Eldridge, cordwainer: I have known the prisoner 20 years; he has always born a good character, and I have never heard of his being convicted. William Charrison, plasterer: I know the prisoner, and recollect him having a lodger. Prisoner wished me to whitewash the room which his lodger had left. Such a barrow as the one produced would be required for his work. Cannot say how long the prisoner's lodger lived in his house. – This witness was afterwards cross-examined, but nothing further of importance was elicited. Mr. Addison, on the part of the prosecution, called Mr. A. O. Hendrey, who stated that he had seen the prisoner three times before the Magistrates. The learned Recorder, in summing up, observed that Juries were often misled by statements of unblemished character. He wished them to understand that the prisoner was without a character; he had been in the employ of Mr. Bray, and the barrow was found in his possession. A second indictment, of a similar character, was then presented against the prisoner. Several witnesses were examined on the part of the prosecution, and the proceeding eventually terminated in the acquittal of the prisoner. From the Dover Telegraph and Cinque Ports General Advertiser, Saturday, 9 May, 1846. Price 5d. Another inquest was held on Monday, before the same Coroner, at the “Wheatsheaf,” Ladywell, on the body of Susannah Ratcliff, a child aged three years. From the evidence of the mother it appeared that, after dinner on Sunday afternoon, she went up stairs to dress, and left deceased in the room below. She was absent about a quarter of an hour, during which time she heard deceased singing. When she came down, not finding the child in the room, she became alarmed, and called her husband, who, with a man named John Belsey, searched the river, and the body was found about two hours after in the river at the back of Mr. Jarvis' house. The door of the passage, leading to the garden, was left open, from whence it is supposed the child fell into the river. From the Dover Express and East Kent Intelligencer, 22 October, 1864. John Thomas East, a young man of about 20 years of age, was charged with threatening the life of his father, Mr. William East, landlord of the "Wheatsheaf" public-house, Ladywell. Defendant's father did not appear, and he was therefore discharged, the Mayor informing him that if he was brought before them again on a like charge, his father would be compelled to appear, and then in all probability the Bench would send him to gaol for three months. From the Dover Express and East Kent Intelligencer, 17 August, 1877. Price 1d. To the editor of the "Dover Express." Six brewers' houses empty! Will any of the six gentlemen who are applying for these licenses live on the premises to conduct the houses themselves? and, if not, should the magistrate grant the transfers? From the Dover Express and East Kent Intelligencer, 5 October, 1877. Price 1d. Permission was given to Mary Ann Ladd to draw at the "Wheatsheaf" public-house. From the Dover Express and East Kent Intelligencer, 33 January, 1880. Price 1d. Abraham Vaughan, a private in the 84th Regiment, was charged with others not in custody with stealing one cake, value 1s. 6d., the property of Mr. Fox, of 2, Park Place. Mary Flaherty said: I live at Mr. Cadman's public-house, the “Wheatsheaf,” which is directly opposite Mr. Flynn's shop. I was in the sitting-room on the first floor of our house on Saturday night about half-past eight when I saw three soldiers standing outside Mr. Fox's shop. One of them went inside and the other walked along Park Street. I saw the one in the shop, which I believe to be the prisoner, take a cake from the window and place it under his overcoat, and then run off after his companions. I immediately went across and told Mr. Fox what had happened and he followed them. By the Bench: The shops were lit up so I could see plainly. They all three had their overcoats on. William Fox, baker, carrying on business at 2, Park Place, said: Between eight and nine o'clock on Saturday night the last witness came into my shop and from what she told me I went after the three prisoners who had gone along Park Street. I came up close to them in the Maison Dieu Road, but when they saw they were followed the prisoner handed something over to the other two who ran off. I followed them a little way, but finding they out-distanced me I came back and took hold of the prisoner who was walking along. I accused him of stealing the cake, and he answered that he had not got the cake but the other two had. I asked him what he had got under his coat and he said a loaf, which he at once produced, saying that he had bought it. I took his as far as St. Mary's Church, where I handed him over to a Police-constable. The value of the cake is 1s, 6d. The loaf the prisoner had was not mine. By the Prisoner: The other two soldiers, who had their overcoats on, belonged to the 84th Regt. By the Bench: I ran after the two not in custody about 30 yards, but returned on finding I could not catch them. The prisoner pleaded “Not Guilty,” and said one of the others stole it. The Military Sergeant said the prisoners enlisted on the 24th December last, and had borne a good character since. The bench sentenced the prisoner to one day's imprisonment, so that he was dismissed at once. From the Whitstable Times and Herne Bay Herald, Saturday 15 September, 1883. Before J. Henderson, (chairman), Matthew Bell, F. Philips, and C. J. Plumptre, Esqs., Sir Walter James, Bart, and Major Lawes. Edward Garlingc and Albert Folwell, lads, were charged on remand, with stealing a rubber and drinking glass, the property of William Spinner, of Guston, on the 19th August. Prosecutor said he was a labourer in the employ of Mr. E. P. Robinson, of Buckland, and had been cutting oats on the 18th ult., with a man named James Talbot. When they finished work they hid the articles mentioned under a shock of corn. On Monday the things were gone. James Talbot also identified the articles as those lost. P.C. Pack deposed that he received information of the thief, and found Garlinge in the "Wheat Sheaf," Dover. He immediately gave up the glass when asked about it and Folwell’s mother handed him the rubber. Prisoners said they found the things in a field close to the road and had no intention of stealing them. A fine of 1s. was inflicted in each case. From the Dover Express and East Kent News, Friday 30 August, 1889. A decided step towards improving the important thoroughfare of Lady well is about to be taken by cutting a slice off the south side, which will remove a projection and place the Town Hall in line with the “Wheat Sheaf Inn” in Park Place. The opening leading up to this improvement has been made by the Corporation purchasing from the estate of the late Mr. Steriker Finnis, the Maison Dieu yard at the rear of the Town Hall, which is represented in the adjoining sketch plan. The dotted line leading from the Town Hall to the "Wheat Sheaf" represents the proposed new frontage. The whole area from the Town Hall up to and including the workshops abutting on the river is in the occupation of Mr. W. J. Adcock, contractor, who held from the late owner a lease which expires in 1898. beyond the workshop is the river Dour, which is included in the Corporation's purchase, and also a slip of land on the further side, giving them the complete control of the stream; but on the street frontage, adjoining the “Wheat Sheaf,” there is built over the river a building which has for years been known as the Ragged School, and is now called the Union Hall. This belongs to another owner, and it is proposed to make arrangements with them to take down the projection to the new line of frontage, and to add on a piece at the back to where the dark line crosses the river, so that the building shall be the same size as now. It is expected that terms to be made with the proprietor of the Union Hall will amount to the cost of making good that building. In our report of the Town Council will be found a proposal from Mr. Adcock for dealing with the Maison Dieu yard. He proposes to give up to the Corporation the area and buildings lying between the dotted line marked “proposed wall” and the Town Hall, and to retain the other portion, except the part required for widening the street, stipulating that the Corporation should rebuild his office, rebuild the boundary walls, and sanction his building a timber shed, &c., on the retained premises. He proposes to surrender the remainder of his lease and to take a new one for 21 years at £70 per year, the present rental for the whole yard being £135. These details of course the Council will have to consider, and also the general policy as to dealing with their newly acquired property, but in the interest of the general public it is desirable that the opportunity for effecting this public improvement should not be lost. From the Dover Express and East Kent News, Friday, 16 January, 1891. Price 1d. W. E. Shaw was summoned under section 16 sub-section 2 of the Act of 1872, with supplying Police-constable Norman Fogg with liquor at midnight, on the 4th of January, at the “Wheatsheaf Inn,” Ladywell. Mr. Vernon Knocker appeared for the prosecution. Mr. Shave said he was ignorant of the law, and did not know what he was doing. He did not ask the constable in. The Superintendent of the police said that the defendant had kept the “wheatsheaf” twelve months, and the house had been well conducted during the time. The Mayor said it was a serious case to harbour a Police-constable, but they took into consideration that this was the first time he had kept a public house, and would not deal harshly with him. He would be fined £1 and 8s. 6d. costs, and his license would not be endorsed. From the Dover Express and East Kent News, Friday, 28 August, 1891. Price 1d. The occupier of this house, who had been fined during the year for serving a policeman with liquor, while on duty, was called up and cautioned. From the Dover Express and East Kent News, Friday 26 April, 1907. Price 1d. A lively scene was witnessed in Pencester Road on Tuesday afternoon, when a soldier who had attempted to steal a bottle of brandy at the “Wheatsheaf,” in Ladywell, was chased by two Policemen down Biggin Street. Entering the timber yard he took to the river, and the two Constables had a lively time before they secured their prisoner. At the Dover police Court on Wednesday, before Messrs. M. Pepper, J. W. Bussey, and E. Chitty, the man, whose name is Charles Phillis, a gunner in the 107th Company Royal Garrison Artillery, was charged with stealing from the bar of the “Wheatsheaf,” Ladywell, a bottle of brandy, the property of Walter Ernest Shave. Mrs. Emily Shave, wife of the prosecutor, who keeps the “Wheatsheaf,” Ladywell, said: Yesterday afternoon, at 20 past 4, the prisoner came into the bar alone. He was quite sober. He called for a pint of beer, and I served him. He paid for it, and sat down in the bar, I went back to the smoking room, and left him alone. I could see into the bar, however, after a few minutes he went along and looked at a picture, and then went back and had another drink. Then he went back to the corner of the bar where the shelves are, and suddenly put his arm up and took this bottle, and then he made for the door. I ran into the bar instantly, lifted the flap, and caught him at the door. He had the bottle in his hand. I said, catching hold of his arm, “You are stealing a bottle of brandy.” He said, “Yes, I know I am.” I said, “Give it back to me at once.” He did so. I said, “I've a very good mind to give you in charge; if I could see a Policeman I would.” Then he tore himself away and went outside the door, I put the bottle down and followed. I saw a Policeman close by, and the man stared running up the street towards the Town Hall. I told the Policeman what had happened, and he ran after him. Afterwards he came back and told me that he had caught the man after a lot of trouble. I went to the police Station, and charged him with theft. The brandy is value 4/6. The prisoner said that he had not got to the door when the last witness rushed out and told him to stop. He handed over the bottle, and advised her to watch her goods better. The Chairman said it was difficult to understand the language of the prisoner because of his brogue. He had no business with the bottle at all, however. Police Constable A Kingsmill said. The last witness, yesterday at 4.30, called me, and pointed out a soldier running up the street, who had stolen a bottle of brandy. I ran after him and caught him. All he said was that he took the brandy down to see it if it was Irish. Witness: I don't know whether it was Irish brandy or whisky. The prisoner pleaded guilty, and elected to be tried by the Magistrates. The Chairman: You intended to have a drink of that brandy but were disappointed. The Bench inflicted a fine of 20/-, which would be stopped out of his pay. His officer did not give him a good character. From the Dover Express and East Kent News, Friday, 11 September, 1914. Price 1d. At the Dover Police Court on Thursday, before Messrs. F. G. Wright and H. F. Edwin. Stephen Ratcliff was charged with being drunk whilst in charge of a horse and trolley in ladywell. Police Constable Smith said at 3.30 on Monday afternoon he was in Ladywell, and saw the defendant driving a horse and trolley laden with timber. Opposite the “Wheatsheaf” he fell off into the road. He was very drunk, and witness took him into custody. The defendant said that he was very sorry that it had happened. The Magistrates said that at this time of national danger they regretted seeing the defendant charged with such an offence. The officers of the Borough had all their work cut out. He would be fined £1. The Chairman added that the Bench was sorry to see so many charged with drunkenness in the town lately. It did not speak well for the decorum of the citizens of Dover. From the Dover Express and East Kent News, Friday, 18 July, 1924. Price 1½d. Mr. Hall, of the "Wheatsheaf Inn," Dover, was granted an occasional licence for the Stanlee Sports at Kearsney on July 26th. From the Dover Express and East Kent News. 11 February, 1938. Price 1½d. 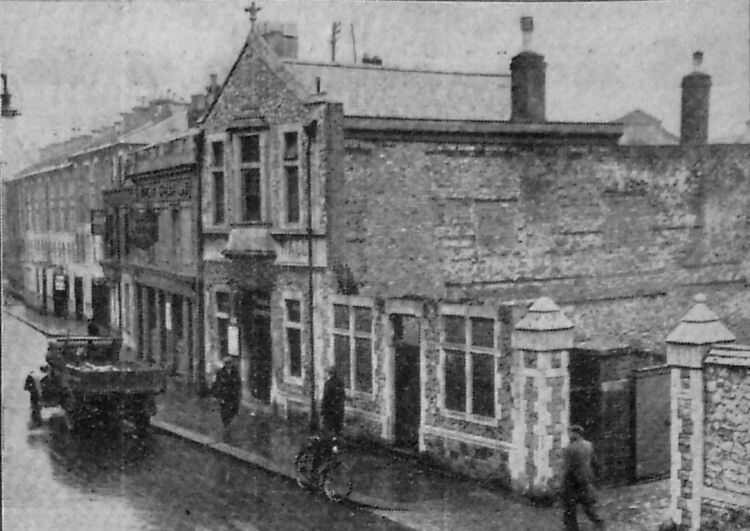 The Town Clerk (Mr. S. R. H. Loxton) objected to the renewal of the licence of the “Wheatsheaf” public house in Ladywell and asked that consideration of the renewal of the licence should be adjourned until the adjourned annual licensing meeting. that was not the place to argue the merits of his application, but the position was that the Corporation had powers to acquire the property compulsorily and a price had been provisionally agreed with the owners. When the property was acquired it would be demolished and the Corporation did not desire it particularly, if it could be avoided, to apply for the removal of the licence. It was to the benefit of the trade that the number of licences should be reduced and it was unfair that the Corporation, representing the ratepayers, should, on purchasing the property, have to lose entirely the money they had paid for the goodwill of the business. He accordingly asked that consideration of the renewal of the licence might be deferred until the adjourned meeting when he proposed to ask the Magistrates to refer the matter to the compensation authority so that the Corporation might receive some compensation in respect of the amount they had paid for the licence. This was not a new procedure; it had been done elsewhere and he submitted that in the circumstances it was a fair and reasonable request. The Bench agreed and adjourned consideration of the renewal of the licence until the adjourned sessions at Dover on March 7th. From the Dover Express and East Kent News. 18 February, 1938. Price 1½d. An application was made by the Town Clerk (Mr. S. R. H. Loxton) for the licence of the “Wheatsheaf Inn,” Ladywell, which was being acquired by the Dover Corporation under a Compulsory Purchase Order, to be referred to the Compensation Authority. Mr. Harold Tuffee (of Harold Tuffee and Smith, Gravesend), appeared on behalf of Kent Brewers' Union to object. 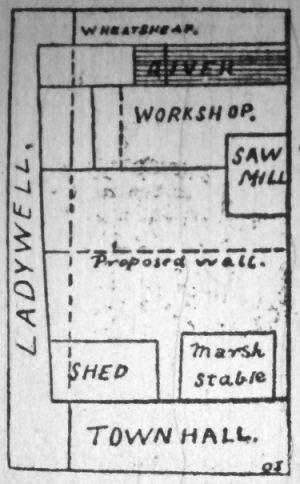 The Town Clerk said that the position with regard to the house was that the Corporation, some little time ago, made a Compulsory Purchase Order for the acquisition of that house the “Wheatsheaf,” Ladywell, and certain other properties, as they desired to erect a new Police Station on the site. All the properties, except the “Wheatsheaf” and one other, had now been acquired by the Corporation as the Compulsory Purchase Order had been confirmed. As regards the “Wheatsheaf,” a price had been agreed with the owners for the acquisition of the property, and the draft contract was in course of preparation. Notice to treat had been served and the Corporation could serve notice of entry, which would enable them to take possession within 21 days. That had not been done yet, but he could tell them the reason why. The agreed price included the full value of the licence attached to it, and, when the purchase was completed, the Corporation would own not only the “Wheatsheaf” but the licence and all the rights and privileges which by law were attached to licensed property, but as they were going to demolish it for Police Station purposes the licence was not of very much use to them. The Corporation would, accordingly be in possession of a valuable asset, for which they had paid full value, and not been able to use it for their own benefit. Under those circumstances it was the duty of the Corporation to co all they could to recover for the ratepayers such money as possible in order to reimburse the ratepayers for what they had spent in acquiring the house. The Corporation, as trustees of the ratepayers, would not be justified nor would they be carrying out their duty if they allowed the licence to lapse and made no effort to recover any part of the cost. Really, the purchase price could be split into two parts, one in respect of property and the other in respect of the licence. There were two ways in which the Corporation then could recover part of the cost which they paid in the acquisition of the licence. One was by applying for the removal of the licence. The Corporation would, without doubt, be at liberty to apply for a special removal and the grounds for refusing were very limited. They were limited to the £structural unsuitability of the premises to which the licence was to be transferred or the unsuitability of the character or otherwise of the proposed licence holder and then, of course, the licence would be void. However, one of the objects of the Licensing Consolidation Act, 1910, had been to reduce, so far as practicable, the number of licences and the number of licensed premises. The Corporation bearing that in mind, had decided that would be the better course for them to adopt than for them to apply to the Magistrates for the removal of the licence. Therefore, he asked the Magistrates to refer the house to the Compensation Authority, who would then consider whether the licence was or was not to be renewed, and if the Compensation Authorities decided the licence was not to be renewed the Corporation would be entitled to receive compensation from the Compensation Fund. The Notice of Objection which had been served in that case contained two grounds of objection. The first was that the Mayor, Alderman and Burgesses having under the Ladywell Place Compulsory Purchase Order, power to acquire these premises and the licence, had resolved to exercise that power and demolish the house for a new Police Station, and accordingly the renewal of the licence was unnecessary and undesirable, and not in the interest of the public. That was his first and main ground of objection. His second ground was that, having regard to the character of the neighbourhood, the number of licences there and in the immediate vicinity, was excessive, and the licence was unnecessary. He did not for one moment suggest that the house was redundant in the usually accepted sense of the word.. He understood that the trade of the house was good, and on the trade question he admitted there would be no grounds for asking the Magistrates to refer it to the Compensation Authority on the grounds of redundancy. It could be argued, and he submitted with some force, that the house might be regarded as redundant on account of the proximity of other licensed houses. There were seven fully licensed houses within two hundred yards – two extremely close, more or less on the other side of the road – five more within three hundred yards and nine more within a distance of 400 yards. There was little doubt that, at any rate, the two nearer houses would be in a position adequately to carry such a trade as the “Wheatsheaf” carried, when the property was demolished. Moreover, it was reasonable to anticipate that the trade at the “Wheatsheaf” might be, in the future, slightly less than it was at the moment, or had been recently on account of the demolition of properties in Ladywell and the re-housing of tenants elsewhere. His main ground was that the property was to be demolished and that the Corporation were going to use the site as a Police Station, and accordingly the renewal was unnecessary and undesirable, and not in the public interest. The Licensing Act of 1910 set6 out the grounds on which the Justices could refuse to renew a licence and without a doubt, Justices had power legally to refer the “Wheatsheaf” to the Compensation Authority on any grounds they saw fit. They had complete discretion in every manner, and did not have to prove in law that it was redundant before they referred it to the Compensation Authority. It was perfectly clear in law that Justices were entitled to accept his first objection as being sound and refer the licence to the Compensation Authorities on the grounds that it was to be demolished and the renewal of the licence was unnecessary and undesirable. That was what he was asking them to do. Of course, the argument might be put forward that it was unfair that the Corporation should seek to benefit from the Compensation Fund as they had not, in fact, contributed to it. In reply to that he would suggest that the Town Council – that was the ratepayers of the town – had purchased these licensed premises, and purchased with them the licence, and if that were surrendered without any compensation it would be the grossest possible injustice to the ratepayers. The surrender of the licence would be a direct gain to other licensees, and it would be most unfair to allow the benefits which accrued from the surrender of the licence to go to other licensed houses in the district without payment of compensation. In asking the Justices to refer the matter, he would point out that it was not for them to decide whether the licence should be ultimately removed. If they referred it to the Compensation Authority the whole matter would be considered by those who might, in that instant, be regarded as a higher authority. He suggested that if the Justices declined to refer that house for compensation they would be taking the matter out of the hands of the higher authority without giving them a chance to adjudicate on it. Having regard to the circumstances he suggested that the Corporation's case was by no means unreasonable. In conclusion, he would like to give the reasons for that application being made then. The Corporation, as he had said, desired to demolish the building and desired to demolish it soon. Although the Corporation had not actually purchased they were in a position to obtain possession at any time within twenty-one days, and if they waited until they actually acquired the property before they made the application it would, in effect, mean waiting until this time next year, and it was hoped that by this time next year, unless something went wrong, that house would not be in existence. He understood that Messrs. George Beer and Rigden, the owners, and whose representative was also the licensee, were not offering any objection to his application in the matter. Inspector Saddleton gave formal evidence in regard top the number of licensed houses in the vicinity, as detailed by the Town Clerk. In reply to Mr. Tuffee, witness said that there were twenty-one licensed houses within a radius of four hundred yards of the “Wheatsheaf.” He thought there were sufficient houses for that area, and he was of the opinion that one or perhaps more could be dispensed with. He understood that the weekly takings of the “Wheatsheaf” were about £30. Mr. Tuffee said that his objection was on behalf of the East Kent Brewers' Union which comprised the whole of the brewers in Kent with two exceptions. He did not think it was necessary for him to refer to the Town Clerk's second ground for objection, because he had no confidence in it himself. The Town Clerk said that the trade of the house was satisfactory, and the only thing was that it was near the other licensed premises, but, of course, it was no nearer to the other houses than they were to it, and there was no reason why this one should be regarded as redundant as opposed to the others. The town Clerk spoke about the Corporation's duty to the ratepayers, to whom they were trustees, but, surely, it was not the duty of the Corporation to dip their fingers into a fund which was raised for an entirely different purpose. The Corporation were going to buy the property and licence, and pay for it, and said, “We can get some of that back, if we are lucky!” But why should they choose to come on the Compensation Fund to recoup themselves when they could easily be recouped by applying for a special removal of the licence? He was going to say straight away that it was not a proper thing to refer this licence to the Compensation Authority. 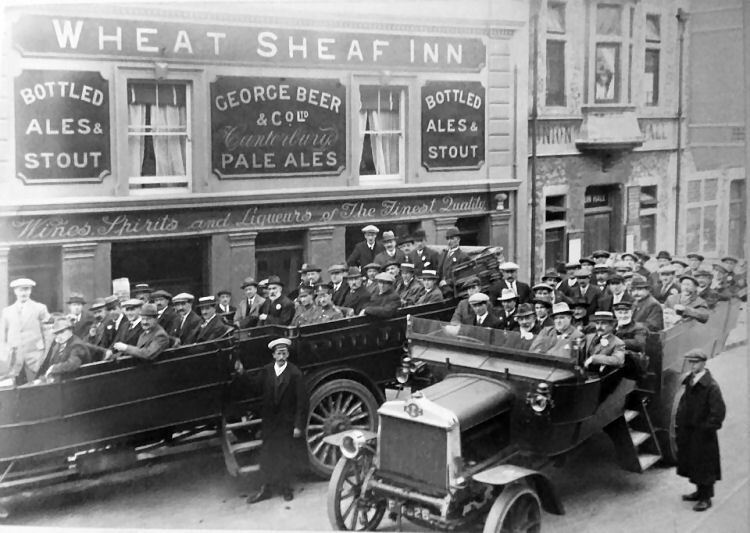 The Compensation Fund was raised or invented to compensate the owners and licensees of premises where the licence was declared and found to be redundant, and it was contributed to by the whole body of licensees and brewers and everybody connected with the trade. He knew he would be referred to another case, the Leeds Corporation v. Rider, of 1907, where the Lord Chancellor said that he saw no objection to arrangements being made between the owners of public houses and the members of the Licensing Committee, with a view to the suppression of licences, under Section 1 of the Act of 1904, and that he regarded that as an obvious and legitimate means of carrying out the intentions of the Act. But it had been held in various ways that that was not necessarily what should be done in every particular case. If they referred to the Housing Act of 1936, that contained special provisions for cases where land purchased by the local authority for slum clearance, re-development areas or improvement areas included licensed premises. The provision stated that if the local authority intimated to the Licensing justices that they were willing to surrender the licence, the Licensing Justices might refer the matter to the Compensation Authority, who on being satisfied that if the licence had hot been surrendered it might properly have been dealt with as redundant, they should contribute out of the Compensation Fund. The Town Clerk would say that that was nothing to do with the case in point. But was that not the law as it stood relating to the reasons for referring a licence which was not redundant, and why it was passed if they could have gone under some other provision? But if the Town Clerk should convince them that they had authority to refer the licence to the Compensation Authority he suggested that that was an authority which they should not exercise. The Corporation had bought an article which was worth money, and why should they not pay for it? What member of the public could properly object to paying a proper price for an article which they required and were empowered to have? He asked the bench to renew the licence unconditionally. That would give the Town Clerk and the Corporation an opportunity to come before them if they thought fit and ask for a special removal of the licence, or, perhaps what they should do, surrender it. The Town Clerk said that the fact that there might have been some doubt cast on the ruling of the Lord Chancellor in the Leeds Corporation case, did not overrule the decision, and if it was not amended by subsequent statutory enactment, whatever doubts there may be, must remain as doubts only. With regard to the Housing Act, this was not a housing matter at all, and because the Housing Act made special provisions, it did not mean that the ordinary commonsense ruling of the Licensing Consolidation Act could not be relied upon. The Magistrates, after they had retired announced that the licence would be referred to the Compensation Authority. From the Dover Express and East Kent News, 11 March, 1938. An application was made by the Town Clerk (Mr. S. R. H. Loxton) for the license of the "Wheatsheaf" Inn, Ladywell, which was being acquired by the Dover Corporation under a Compulsory Purchase Order, to be referred to the Compensation Authority. Mr. Harold Tuffee, (of Harold Tuffee and Smith, Gravesend), appeared on behalf of the Kent Brewers' Union to object. The Town Clerk said that the position with regard to the house was that the Corporation, some little time ago, made a Compulsory Purchase Order for the acquisition of the house, the "Wheatsheaf," Ladywell, and certain other properties, as they desired to erect a new Police Station on the site. All the properties except the "Wheatsheaf" and one other, had now been acquired by the Corporation, as the Compulsory Purchase Order had been confirmed. As regard the "Wheatsheaf," a price had been agreed with the owners for the acquisition of the property, and the draft contract was in course of preparation. Notice to treat had been served and the Corporation could serve notice of entry, which would enable them to take possession within 21 days. That had not been done yet, but he could tell them the reason why. The agreed price included the full value of the licence attached to it, and, when the purchase was completed, the Corporation would own not only the "Wheatsheaf" but the license and all the rights and privileges which by law were attached to licenses property, but as they were going to demolish it for police station purposes the licence was not of very much use to them. The Corporation would, accordingly be in possession of a valuable asset, for which they had paid full value, and not be able to use it for their own benefit. Under those circumstances it was the duty of the Corporation to do all they could to recover for the ratepayers such money as possible in order to reimburse the ratepayers for what they had spent in acquiring the licence. The Corporation as trustees of the ratepayers, would not be justified nor would hey be carrying out their duty if they allowed the licence to lapse and made no effort to recover any part of the cost. Really, the purchase price could be split into two parts, one in respect of the property and the other in respect of the licence. There were to ways in which the Corporation could recover the cost which they paid in the acquisition of the licence. One was by applying for the removal of the licence. The Corporation would, without doubt, be at liberty to apply for a special removal and the grounds for refusing were very limited. They were limited to the structural unsuitability of the premises to which the licence was to be transferred or the unsuitability of the character or otherwise of the proposed licence holder, and then of course, the licence would be void. However, one of the objectives of the Licensing Consolidation Act, 1910, had been to reduce, so far as practical, the number of licences and the number of licensed premises. The Corporation, bearing that in mind, had decided that would be the better course for them to adopt than for them to apply to the magistrates for the removal of the licence. Therefore, he asked the magistrates to refer the house to the Compensation Authority, who would then consider whether the licence was or was not to be renewed, and if the Corporation Authority decided that the licence was not to be renewed the Corporation would be entitled to receive compensation from the Compensation Fund. The Notice of Objection which had been served in that case contained two grounds of objection. The first was that Mayor, Alderman and Burgesses having under the Ladywell Place Compulsory Purchase Order, power to acquire these premises and the licence, had resolved to exercise the power and demolish the house for a new police station, and accordingly the renewal of the licence was unnecessary and undesirable, and not in the interests of the public. That was his first and main ground of objection. His second ground was that, having regard to the character of the neighbourhood, the number of licences there and in the immediate vicinity, was excessive, and the licence was unnecessary. He did not for one moment suggest that the house was redundant in the usual accepted sense of the word. He understood that the trade of the house was good, and on the trade question, he admitted there would be no grounds for asking the magistrates to refer it to the Compensation Authority on the grounds of redundancy. It could be argued, and he submitted with some force, that the house might be regarded as redundant on account of other licensed houses. There were seven fully licensed houses within two-hundred yards - two extremely close, more or less on the other side of the road - five within three hundred yards and nine or more within a distance of 400 yards. There was little doubt that, at any rate, the two nearer houses would be in a position adequately to carry such trade as the "Wheatsheaf" carried, when the property was demolished. Moreover, it was reasonable to anticipate that the trade at the "Wheatsheaf" might be, in the future, slightly less than it was at the moment, or had been recently on account of the demolition of property in Ladywell and the re-housing of the tenants elsewhere. His main ground was that the property was to be demolished and the Corporation were going to use the site as a police station, and according to the renewal was unnecessary and undesirable, and not in the public interest. The Licensing Act of 1910 set out the grounds on which Justices could refuse to renew a licence and, without a doubt, Justices had power legally to refer the "Wheatsheaf" to the Compensation Authority on any ground they saw fit. They had complete discretion in every manner, and did not have to prove in law that it was redundant before they referred it to the Compensation Authority. It was perfectly clear in law that the Justices were entitled to accept his first objection as being sound and refer the licence to the Compensation Authority on the grounds that it was to be demolished and the renewal of the licence was unnecessary and undesirable. That was what he was asking them to do. Of course, the argument might be put forward that it was unfair that the Corporation should seek to benefit from the Compensation Fund, as they had not, in fact, contributed to it. In reply to that he would suggest that the Town Council - that was the ratepayers of the town - had purchased these licensed premises, and purchased them with the licence, and if that were surrendered without any compensation it would be the grossest possible injustice to the ratepayers. The surrender of the licence would be a direct gain to other licensees, and it would be most unfair to allow the benefits which occurred from the surrender of the licence to go to other licensed house in the district without payment or compensation. In asking the Justices to refer this matter, he would point out that it was not for them to decide whether the licence should be ultimately renewed. If they referred it to the Compensation Authority the whole matter would be considered by hose who might, in that instance, be regarded as a higher authority. He suggested that if the Justices declined to refer the house for compensation they would be taking the matter out of the hands of the higher authority without giving them a chance to adjudicate on it. Having regard to the circumstances he suggested that the Corporation's case was by no means unreasonable. In conclusion, he would like to give the reasons for that application being made. The Corporation, as he had said, desired to demolish the building and desired to demolish it soon. Although the Corporation had not actually purchased they were is a position to obtain possession at any time within twenty-one days and if they waited until they actually acquired the property before they made the application it would, in effect, mean waiting until this time next year, and it was hoped that by this time next year, unless something went wrong, the house would not be in existence. He understood that Messrs. George Beer and Rigden, the owners, and whose representative was also the licensee, were not offering any objections to his application in the matter. Inspector Saddleton gave formal evidence in regard to the number of licensed houses in the vicinity, as detailed by the Town Clerk. In replying to Mr. Tuffee, witness said that there were twenty-one licensed houses within the radius of four hundred yards of the "Wheatsheaf." He thought there were sufficient houses for that area, and he was of the opinion that one or perhaps more could be dispersed with. He understood that the weekly takings at the "Wheatsheaf" were about £30. Mr Tuffee said that his objections were on behalf of the Kent Brewers' Union, which comprised the whole of the brewers in Kent, with two exceptions. He did not think it was necessary for him to refer to the Town Clerk's second ground of objection, because he had no confidence in it himself. The Town Clerk said that the trade of the house was satisfactory, and the only thing was that it was near other licensed premises, but of course, it was no nearer to the other houses than they were to it, and there was no reason why this one should be regarded as redundant as opposed to the others. The Town Clerk spoke about the Corporation's duty to the ratepayers, to whom they were trustees, but, surely, it was not the duty of the Corporation to dip their fingers into a fund which was raised for an entirely different purpose. The Corporation were going to buy the property and licence, and pay for it and said, "We can get some of that back, if we are lucky!" But why should they choose to come on the Compensation Fund to recoup themselves when they could easily be recouped by applying for a special removal of the licence? He was going to say straight away that it was not a proper thing to refer this licence to the Compensation Authority. The Compensation Fund was raised or invented to compensate the owners and licensees where the licence was declared and found to be redundant, and it was contributed to by the whole business of licensees and brewers and everyone connected with the trade. He knew he would be referred to another case, the Leeds Corporation v. Rider, of 1907, where the Lord Chancellor said that he saw no objection to arrangements being made between the owners of public houses and the members of the Licensing Committee, with a view to the suppression of licences, under Section 1 of the Act of 1904, and that he regarded that as an obvious and legitimate means of carrying out the intentions of the Act. But it had been held in various ways that that was not necessarily what should be done in every particular case. If they referred to the housing Act of 1936, that contained special provisions for cases where land purchases by the local authority for slum clearance, to development areas or improvement areas is included licensed premises. The provisions stated that if the local authority intimated to the Licensing Justices that they were wishing to surrender the licence, the Licensing Justices might refer the matter to the Compensation Authority, who on being satisfied that if the licence had not been surrendered it might properly have been dealt with as redundant, they should contribute out of the Compensation Fund. The Town Clerk would say that that was nothing to do with the case in point. But was not the law as it stood relating to reasons for referring a licence which was not redundant and why was it passed if they could have gone under some other provision? But if the Town Clerk should convince them that they had authority to refer the licence to the Compensation Authority he suggested that was an authority which they should not exercise. The Corporation had bought an article which was worth money, and why should they not pay for it? What member of the public could properly object to paying a proper price for an article which they required and were empowered to have? He asked the Bench to renew the license unconditionally. That would give the Town Council and the Corporation an opportunity to come before them if they thought fit and ask for a special removal of the licence, or, perhaps what they should do, surrender it. The Town Clerk said that the fact that there might have been some doubt cast on the ruling of the Lord Chancellor in the Leeds Corporation case, did not override the decision, and if it was not amended by subsequent statutory enactment, whatever doubts there may be, must remain as doubts only. With regards to the Housing Act, this was not a housing matter at all, and because the Housing Act made special provisions, it did not mean that the ordinary common sense ruling of the Licensing Consolidation Act could not be relied upon. The Magistrates, after they had retired, announced that the licence would be referred to the Compensation Authority. From the Dover Express and East Kent News, 17 June, 1938. The East Kent Licensing Authority met at Canterbury on Friday last, when the four Dover houses referred to by the licensing Justices came up. In the "Wheatsheaf" case, Mr. B. H. Waddy appeared on behalf of the Renewal Authority and the Dover Corporation. Mr. Tuffee appeared for the East Kent Brewers' Union, Messrs. Truman, Fremlin, Shephard Neame, Cobb an Co., Charrington, etc. Mr. Waddy said that the Corporation obtained power for the compulsory acquisition of the "Wheatsheaf," and agreed to a figure for the purchase of the premises and the licence as well. Of course the problem arose where licensed premises were to be pulled down as to what was to happen to the licence, which was a valuable asset. There were various ways of dealing with it, and one was the way that the Corporation had adopted. Hey had said to the Licensing Justices, "We object to the renewal of this licence, and ask you to refer it to the Compensation Authority with a view to its being extinguished, because the "Wheatsheaf" is no longer required by the public. There are other houses in the vicinity, and it is in the public interest that the licence should be entirely extinguished as the premises are going to be pulled down and turned into a police station." Another way to deal with the matter was to go before the Licensing Justices for a special removal of the licence to other premises. There could have been anywhere - even next door to another public house - providing they were proper premises. The Corporation could then have carried on the licensed business themselves, as other Corporations did, or they could have sold their house with the licence to some person in the trade. What the Corporation said was that the licence was not required, and there should be recovered for the ratepayers as much as the Compensation Authority should pay having agreed to the value of the licence. Opposition to the scheme did not come from any Dover people at all. It had been suggested that it was an improper arrangement for the Corporation to acquire licensed premises which they were going to pull down and go to the Licensing Authority to ask for compensation. In answer to that, he quoted a similar case, in which Leeds Corporation acquired licensed premises. Mr. S. R. H. Loxton, Town Clerk of Dover, gave evidence in support of Mt. Waddy's statements. In answer to Mr. Tuffee's cross-examination, Mr. Loxton said that the price had been fixed at £4,000. He did not know ho much for the licence. Mr. Tuffee: You do not contend that these premises are redundant in the usual sense of the word? Mr. Loxton: No, I do not think I can. Mr. Tuffee: The only reason for asking for this house to be referred to the Compensation Authority is because the Corporation have bought it and do not want to continue it? - Yes. Cross-examined by Mr. Tuffee, Inspector Saddleton, who gave evidence as to the neighbourhood, said that the "Wheatsheaf" was not included in the Chief Constable's annual report as a house to be referred. Mr. Tuffee said that neither he nor his clients were making any suggestions that the Justices acted improperly in anything they did in referring that matter. One of the strong points made in the Leeds case, which went to the House of Lords, was that the Magistrates had acted improperly and had not exercised any judicial discretion in the way it should be done. He did not challenge hat the Magistrates had a right in this case to refer it to the Compensation Authority, but he did not think that it was proper. What right had the Corporation to assume the duties of the Licensing Authority? They must come there with their tongue in their cheek when they said, "We consider it an unnecessary license." The only reason they could suggest was that they had to pay for it. The Authority had to consider whether the licence could be said to be redundant; and that had to be considered on the evidence. There was not one jot of tittle or evidence before them that it was redundant. It had been suggested my Mr. Waddy that the trade would go elsewhere, but he suggested that the reason the matter was not brought forward as a "Special removal" was because it was not brought up on time. The Corporation were keeping the premises open merely for the purpose of getting some of the compensation money. What the Corporation were saying was, "We have bound ourselves to a sum of £4,000. Here is a chance of getting someone else to pay for it." Following a retirement, the Chairman announced that a renewal of the licence would be refused. Mr. Tuffee: Subject to compensation? Mr. Tuffee: I shall ask you in due course to state a case. From the Dover Express and East Kent News, 10 February 1939. 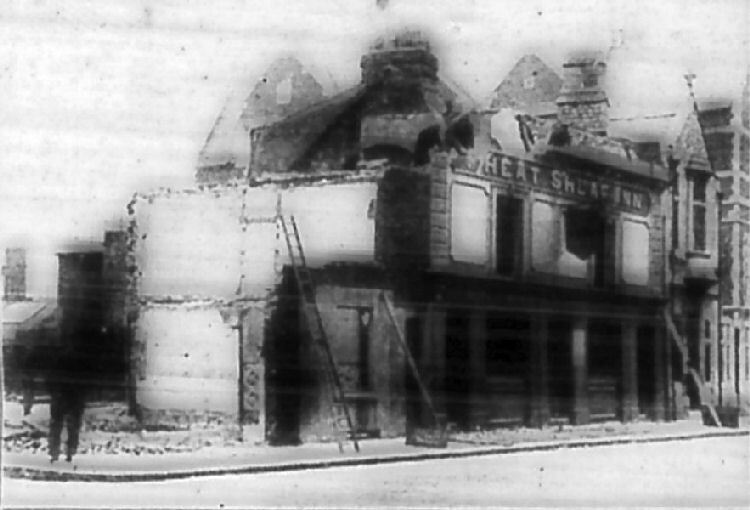 The Union Hall, the "Wheatsheaf Inn," and the shop adjoining which is about to be demolished in connection with the widening of Ladywell where it will abut on the new Police Station. The Union Hall (recently used for A.R.P. purposes has had its contents removed to Woodlands Factory in Bridge Street, which the Town bought. A sale of effects at the "Wheatsheaf" took place on Tuesday. From the Dover Express and East Kent News. 24 February 1939. THE END OF THE "WHEATSHEAF" INN. 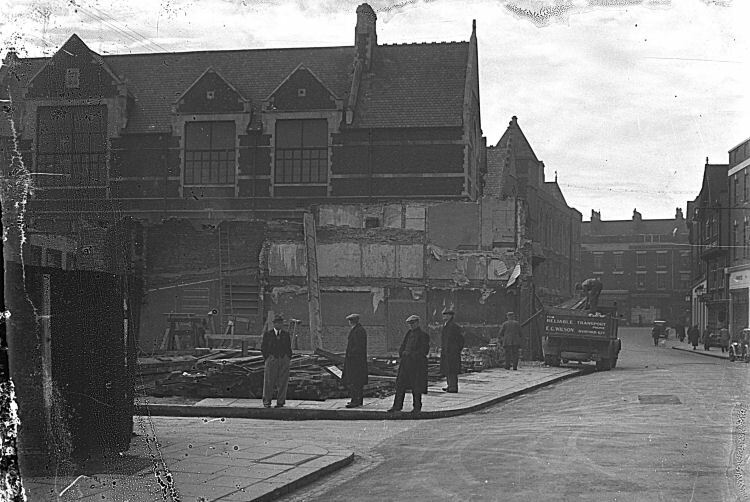 Demolishing the remaining properties in Ladywell adjoining the site of the new Police Station. 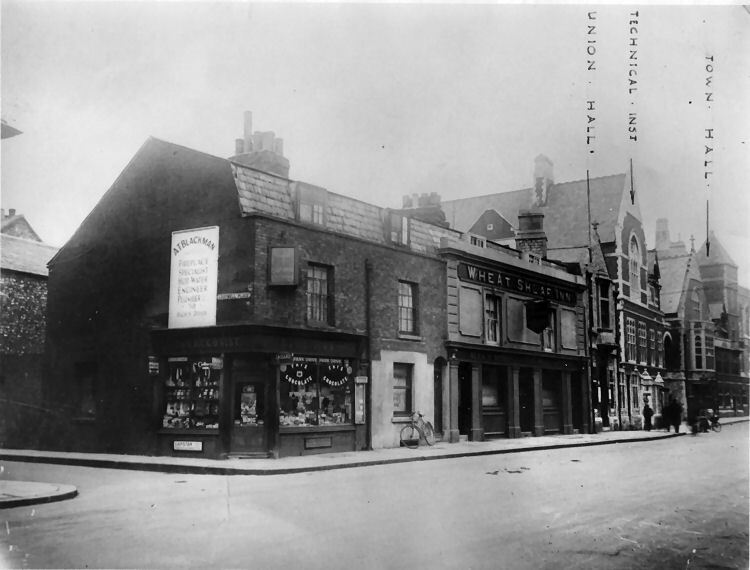 The shop formally on the corner of Ladywell Place, the "Wheatsheaf" Inn, and the Union Hall are involved, the intention being to improve the alignment of the road. From the Dover Express and East Kent News, Friday, 17 November, 1939. Their many friends in Dover will congratulate Mr. and Mrs. W. E. Shave, of Reading, who celebrated their golden wedding on Monday. Mr. "Dollar" Shave was formerly at the "Wheatsheaf," Ladywell, and later had a tobacconist's business in High Street. The whole of Ladywell Place was compulsory purchased by Dover Corporation in 1936. Notices to quit the house had already been issued by September that year and the purchase was confirmed by the Ministry of Health in February 1938. On 20th November 1939 Mr. and Mrs. Shave, then of Reading, celebrated their Golden Wedding the Dover Express reported and stated that they later had a tobacconist's business in High Street. The price of the "Wheatsheaf", including the licence, was £4,000. An agreed compensation figure of £2,300 was also mentioned and may have formed part of the larger figure. I do not know. In an effort to recover some part of the ratepayers money, the Council resolved to declare the pub redundant and have it referred. The Kent Brewers Association took exception to that and objected to the fund being so abused. Right or wrong, the Bench did agree it was surplus to requirements in March 1938. Seven fully licensed houses were within two hundred yards and twenty one within a four hundred yard radius. The renewal was refused in June 1938 which then made it eligible for compensation. The end of the story never came my way. It did go on. Perhaps the figure of £2,300 mentioned earlier was the result. I do not know. Although ready for demolition, it must have still stood in February 1939 when a provisional licence covered. It must have disappeared shortly after that because a new police station had opened on the site by September 1940. Just in time to be partially wrecked by a bomb two months later. GODDARD John 1897 end ? These seem to overlap so may be false or from another Wheatsheaf other than Dover. The Dover Express reported that Mr. T. R. Hall was at the time the licence was transferred in 1918 was employed as manager to a firm of grocers, but said "as soon as the firm can release me, I will leave that position and devote all my time to the "Wheatsheaf." The Dover Express reported that Seth Layton Twigg had previously been at the "Lamb and Lion Inn," Lower Boro Walls, Bath.